In the aftermath of the bloodshed on Monday in the Gaza Strip, many Palestinians are demanding justice for the 60 people who were killed by Israeli forces, writes the CBC’s Middle East correspondent Derek Stoffel. 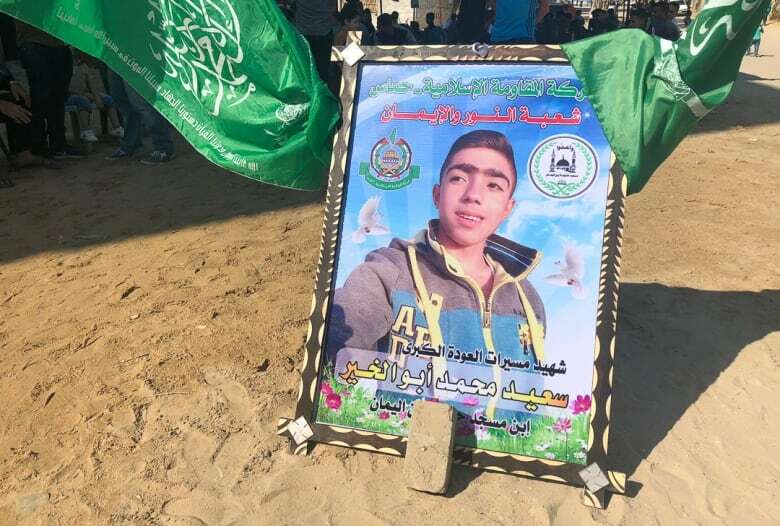 Hours after Mohammad al-Kher buried his 15-year-old son, he called on the international community to press for justice for the Palestinians who were killed by Israeli forces in Gaza, including his boy Said. "Israel is a state that doesn't respect human rights," al-Kher said. But the grieving father added that he is not hopeful anyone will be held to account. "The world doesn't do anything to make sure Israeli respects human rights," al-Kher told CBC News as he hosted friends and family at a visitation for his son under the canopy of a tent outside the family's home in Gaza City. Across Gaza, Palestinians are demanding action after 60 people were killed in a bloody day of violence on Monday. Israeli forces used live ammunition during mass protests to stop demonstrators from penetrating the barrier that separates Gaza from Israel. Israeli soldiers killed two Palestinians on Tuesday during smaller protests near the fence. While the violence has since subsided, tensions in Gaza remain high, as Israeli tanks targeted Hamas positions inside the strip after heavy machine gun fire struck a house in an Israeli city near Gaza on Wednesday. Hamas, the militant group that controls Gaza and urged Palestinians to protest on Monday, is eager to capitalize on the international condemnation aimed at Israel for its response to the protestors, including criticism from Canada. "Reported use of excessive force and live ammunition is inexcusable. It is imperative we establish the facts of what is happening in Gaza," said Prime Minister Justin Trudeau in a statement on Tuesday, which also called for an independent investigation into what happened on Monday. Hamas has vowed that it will continue the protests in Gaza, but the militant group — deemed a terrorist organization by Canada, Israel and other nations — is believed to be pondering the best way to keep up pressure on Israel. Arab media sources report that Hamas is under pressure from Egypt to scale back calls for demonstrations, which could lead to calmer scenes on Friday near the border area. Hamas has been urging Palestinians in Gaza to take part in demonstrations for the past seven weeks. The "Great March of Return" called for Gazans to be allowed back to their ancestral homes in what is now Israel and highlighted the dire economic and social conditions in the Palestinian territory, largely attributed to the blockade by Israel and Egypt. More than 100 Palestinians have been killed since the demonstrations began on March 30. Hamas said Wednesday that 50 of its members were among the 60 people who died during Monday's violence. Israel's military has said for weeks now that Hamas has been using the demonstrations as cover for its men to launch attacks against Israel by damaging the separation barrier and trying to infiltrate Israeli territory. Israeli Prime Minister Benjamin Netanyahu said Hamas should be held responsible for the deaths in Gaza. "They're pushing civilians women children into the line of fire with a view of getting casualties," Netanyahu told CBS News. "We try to minimize casualties. They're trying to incur casualties in order to put pressure on Israel, which is horrible." Gaza's hospitals, already suffering from shortages of medicine, supplies and even power, are still struggling to treat those injured on Monday. Doctors Without Borders told CBC News that 1,300 gunshot wounds were reported that day. "We question this disproportionate use of the force [by Israel]," said Marie-Elisabeth Ingres, the head of mission for Doctors Without Borders in the Palestinian territories. "We question the … use of live ammunition against young protestors." 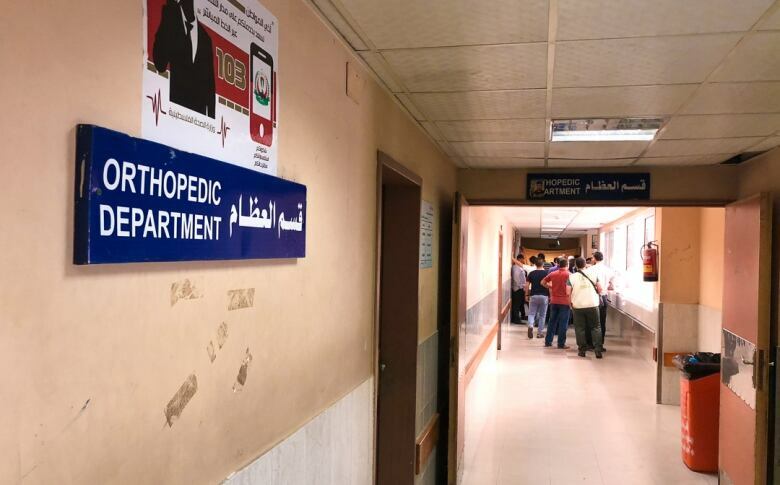 The orthopedic ward at Gaza's main hospital, al-Shifa, was overflowing with patients suffering gunshot wounds to their legs, and visiting relatives. 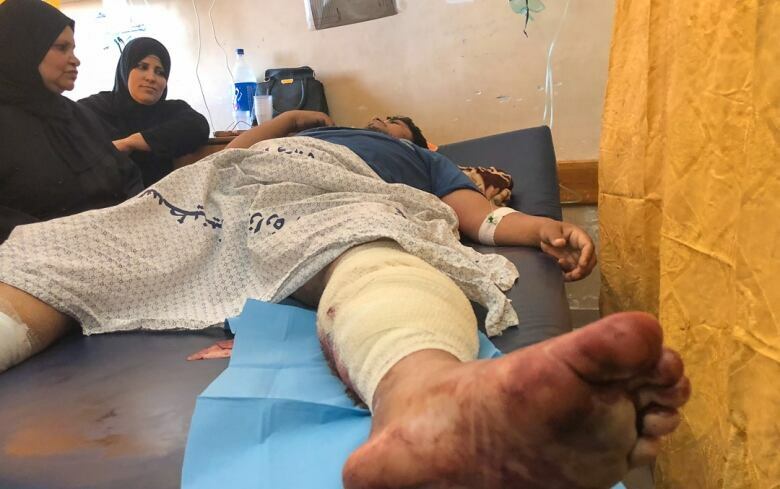 "When we go to a peaceful rally, Israel responds with violence and bullets," said Said Rachman, standing next to his son Ibrahim, who had bloodied bandages on both his legs. Rachman said his son was shot by an Israeli sniper moments after disembarking from a bus that brought demonstrators to the periphery of Gaza on Monday. He denied that Ibrahim is a Hamas member. Much of Gaza is now focused on Ramadan, which begins Thursday. 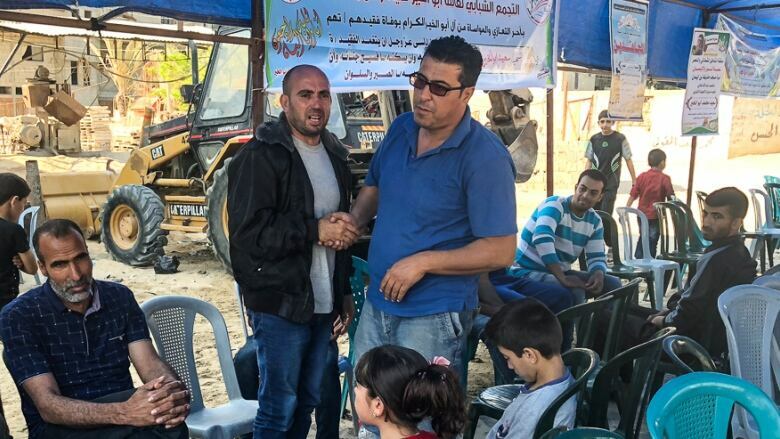 But as many families are still in mourning, celebrations during the holy month in the Palestinian enclave will be dampened by the aftermath of Monday's bloodshed and harsh economic realities faced by residents. When Hamas took control of Gaza a decade ago, Israel imposed a blockade, restricting the movement of people and goods. Egypt has more recently shut access to the southern border. Most of Gaza's 1.9 million residents cannot leave the territory. Residents often say they live in the world's largest open air prison. Mohammad al-Kher, the father who lost his son on Monday, said Said was "a normal kid with normal dreams." 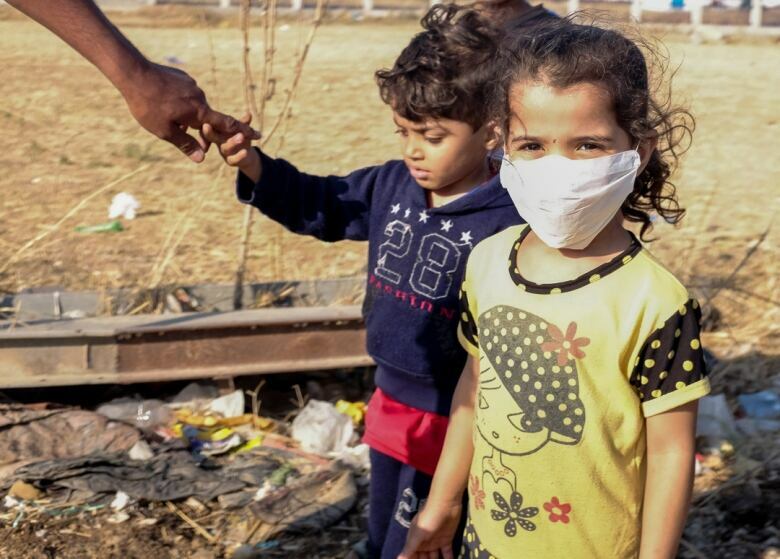 "He just wanted to see the world from outside of Gaza," he told CBC News. "He was like a young flower, and now he's gone." 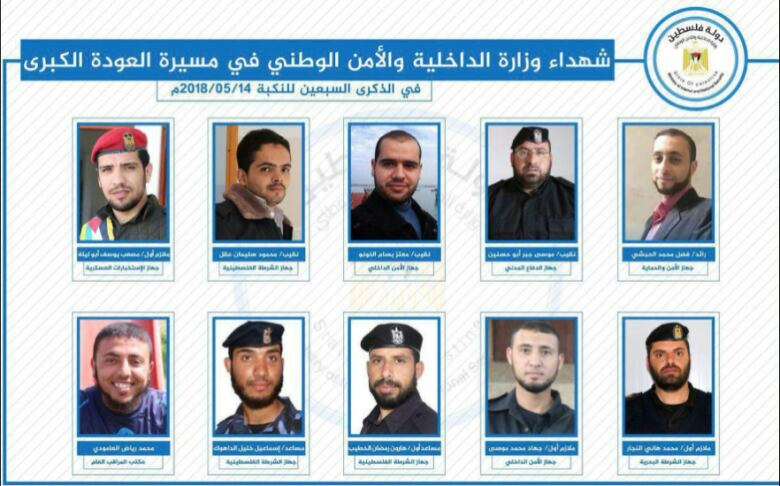 An earlier version of this story stated that an image showing 10 Gaza Interior Ministry staff that officials say were killed by Israeli forces came from Hamas. In fact, the source of the press release was mis-translated. It came from a Gaza Ministry of the Interior press release.